Facebook is one of the most used social network service and website online. As of July 2010 Facebook has more than 500 million active users. Users may create a personal profile, add other users as friends and exchange messages, including automatic notifications when they update their profile. Additionally, users may join common interest user groups, organized by workplace, school, or college, or other characteristics. The name of the service stems from the colloquial name for the book given to students at the start of the academic year by university administrations in the US with the intention of helping students to get to know each other better. Facebook allows anyone who declares themselves to be at least 13 years old to become a registered user of the website. While Facebook is a great idea and community for staying in contact with friends it can also be harmful as with anything on the internet. At this time there are currently two instances where people have met on Facebook which led to the murder of one of the individuals. Unbelievable it is, but Facebook provides the perfect solution for those wishing to target individuals and later meet up with their 'new friends' in person. So, in an effort to protect your loved one and children, why not monitor their actions on Facebook with a Facebook spy software? You can record their keystrokes, who they send emails to, who they instant message, and much more. You will also be able to record when they use Facebook and whose profiles they frequently visit. What does Facebook Spy Monitor do? Facebook Spy Monitor is a Facebook use monitoring software mainly for parents. It secretly records PC users' Facebook private profile, emails, chats & IMs, photos, interests, contatcts and events by taking screen snapshots periodically. Facebook Spy Monitor also records users' online searches about Facebook, popular Facebook instant messenging clients, and Facebook related web sites. You can see exactly what the users were doing just like watching a surveillance video playback. You can view the screenshots directly from the embedded image / slideshow viewer. It is especially useful for parents, who need to know what their kids are care and talking about with others. The software is invisible to computer users. However, it is very easy for you, the administrator to use your hotkey to unhide it from complete Stealth Mode. The hotkey is ONLY available in your only Windows user account so that other users won't be able to guess it by enumerating key combinations. And the program access can also be protected by password. You can uninstall it easily from the its neat interface. You can download Facebook Spy Monitor spy software and take a trial before order to make sure it works for you. Who needs Facebook Spy Monitor? * Their kids will not allow them to see their Facebook profile, so parental monitoring is difficult. * Their kids are hiding the fact that they have Facebook profiles. Monitoring software may be the only solution in some cases. To protect your kids online, it is absolutely all right to use a monitoring software! Capture Screen: monitors and records PC users' Facebook activities that may include private profiles, emails, chats & IMs, photos, friend lists and social events by taking screen snapshot of Facebook site, FacebookIM, and Facebook related searches, web sites. Save Screenshots as JPG format: the captured screen will be automatically saved as JPG images. You can set JPG quality from 20% - 100% and the maximum images stored on your computer hard disk drive. Stealth Mode: Facebook Spy Monitor spy software run absolutely invisibly under Windows systems and does not show in Windows task list. 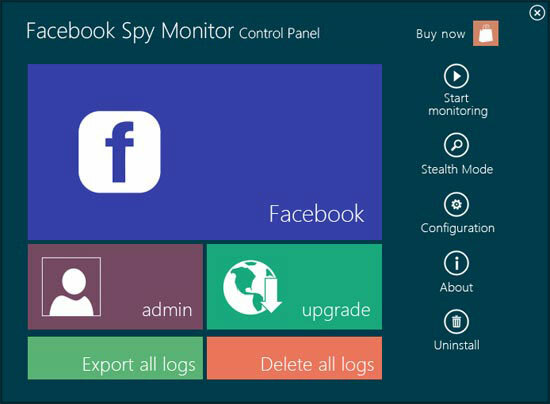 You can also choose to hide or unhide Facebook Spy Monitor spy software icon and its uninstall entry. In Stealth Mode, the programis protected by hotkey and password. Hotkey is only available in your own Windows user account. Slide Show : choose to overview all captured images from program main interface. You can delete selected images or clear all images or start a slide show. You can display listed images in an embedded slide show viewer, like watching a playback on VCR. Task Schedule: You can set starting and ending time for each task to automatically start and stop the monitoring job. Easy-to-use Interface: configure Facebook Spy Monitor spy software with either Wizard for common users or control panel for advanced users. User-friendly graphical program interface makes it easy for beginngers.